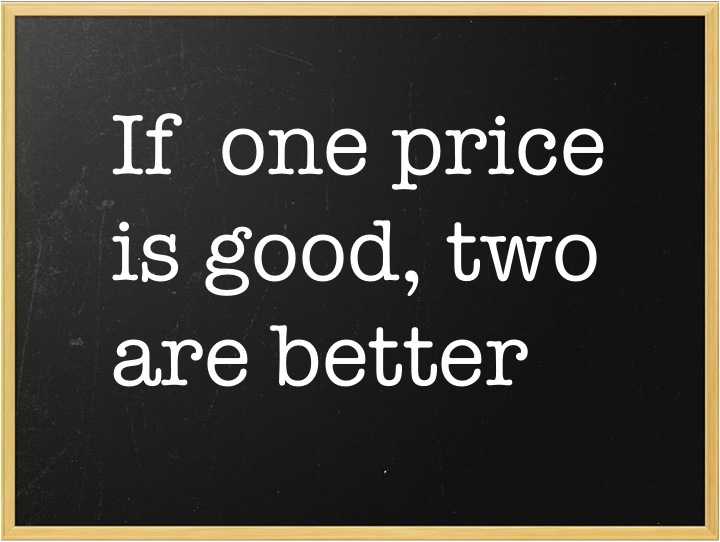 If One Price is Good, Two are Better – a Fallacy? Gross Generalization? It is written in the blackboard I use in my Twitter and WordPress profile pictures. Is it just a tag-line? Worse, is it a gross generalization or a fallacy? In a previous article I wrote about the 1% price increase fallacy, and I frequently write articles on gross generalizations by other authors. Shouldn’t I look at my own tag-line even if I don’t give it the same level of scrutiny I give to others? First and foremost – Yes it is a tag-line and there are situations where it is not true. Origins of this statement: It is rooted in price discrimination which was first written about by the economist Pigou. He did not use these exact words. I am reluctant to claim full ownership of this statement. I am convinced I have read this before but my searches come up empty, so I own it for now. The claim I make is weaker than the claim made by general price discrimination theory. My claim stops at two prices, requires that “one price must be good, i.e., there is a market for the product at a given price”, and does not imply scaling or generalization. Different customers must value the various versions differently. This means customers’ needs and the value they get from the product must be different. There must be no arbitrage opportunity. The products must not be commodities or easily substitutable – products must add unique value to customers. It is easy to see why (1) is true for most products. If it is not true today then everyone will buy a product at any price. Since that isn’t the case we can accept (1) to be true. For most products we develop and market there is no arbitrage opportunity. This is especially true for digital goods and webapps. Finally, your product is a commodity only if you let it be. The most common refrain I hear about webapps is, “if you don’t make it free your competitors will”. If your webapp adds no unique value or easily substitutable then it is a commodity. But does it have to be that way? Isn’t that why we have marketing, value-messaging and positioning? Note: You can read my articles on 4 Costs of versioning and how to design and price the versions. I offer three versions of these articles all priced differently. ← Observations on iMac Pricing – A case of well executed versioning? Great post. I don’t do research in pricing but in web usability and during some of our research we have seen examples of your “one price is good, two are better!” statement: when a company offer e.g. 3 versions instead of only 1 the test subjects often start to think of “what version fits me best?” instead of “should I buy this product?” (when there is only 1 version).